Knee-deep in late summer prairie grass, Fred Rayl is letting a young pointer prospect figure things out on his own. At this stage of the game, the pup is all instinct and exuberance. Rayl watches patiently. Suddenly, the pup catches a whiff to his liking, and the unmistakable light of recognition, age-old and inborn, fires his bright eye. He makes a couple of searching swings through the buckbrush, then snaps into point, and we glimpse the dog he might one day become: it’s the pose of a champion. The lone sharptail, an old bachelor chicken, departs with a volley of raucous complaints, and the image explodes as the pup takes off in wild pursuit. “He’ll be back,” Rayl predicts. We follow his progress, squinting against the afternoon glare, and sure enough, a quarter mile out on the prairie the pup has abandoned the chase and is coming around. The grin that breaks over his broad, sunburned face tells you Rayl is a man who loves what he does. I ask for his story. “It all started with daddy,” he says of late Hall of Famer, William F. (Bill) Rayl. “Him and his brother Allen Earl were hunters as boys. They always had good hunting dogs, and that was how they made their spending money up there in Athens, Tennessee.” Dressed quail, peddled for a quarter a piece to the local shopkeeper, kept the boys flush. Then Bill joined the service and his brother lost interest. The meat-hunting enterprise fell flat, but when Bill finished his tour of duty and came home, he found Allen Earl had kept an old bird dog around. “Is he any ‘count?” he inquired. The next day, Bill grabbed his gun, whistled up the dog and set off across the farm fields to find out. The dog ran hither and yon, but Bill headed for a known covey spot. He walked the birds up and killed one. Luckily, boys have a way of thriving on such escapades. The Rayl brothers emerged from their youthful adventures unscathed, with a lasting love of bird dogs, and field trials and a strong work ethic woven firmly into the fabric of their lives. “Oh, there’s lots of good memories,” says Rayl, who eagerly traded his text books for the paraphernalia of a professional trainer upon high school graduation. While he worked dogs and campaigned with Bill on the all-age circuit, Eddie specialized in shooting dogs. Bill Rayl was a dedicated, hard-working man, up before daybreak each morning, sticking to a schedule that rarely varied unless a field trial intervened. “It was seven days a week,” Rayl says. “Even though we didn’t work on Sundays most of the time unless we were gone to a trial, daddy would still get up and go walk out there through the kennels.” That commitment set a strict standard and elicited the admiration and respect of his two sons. But after hitting a hard lick all week and kicking up their heels on Saturday nights, the boys looked forward to sleeping in on those rare Sunday mornings at home. Rayl’s remarkable success as a trainer and handler of field trial champions may be equaled by his acumen as a breeder, for his effect in that regard has left an indelible mark on pointerdom. He was instrumental in establishing the bloodlines that put forth the great Hall of Fame dogs Evolution, Builder’s Addition, Fiddler and his celebrated scion, Fiddler’s Pride, and shooting dog sensation Little Diamond, along with a plethora of other notables. Bill always thought he would win the National Championship with Highway Man. It was not to be, but one shining moment at Grand Junction sticks in memory. Jimmy Bryan of the Ames Plantation used to tell the story that Rayl recounts. The aforementioned Endurance had come into his own during this period with a number of major circuit all-age wins and was effectively crossed with a variety of bloodlines to produce some 50-odd field trial winners. The mating of Endurance with Miss Holmes of Riggins White Knight and Gunsmoke lineage proved particularly favorable, for it produced one of modern pointerdom’s most influential progenitors. Evolution was whelped January 21, 1972. The Field Dog Stud Book registry shows A. E. And W. F. Rayl to be the breeders. Owned by Tennessee patron T. Jack Robinson, campaigned by the Rayls to a half-dozen titles in a career that was blindsided by speargrass complications, the prepotent “Hack” nicked successfully with 110 different dams to sire a total of 268 winners accounting for some 1,500 placements. He died March 9, 1985 at the age of 13, and was inducted into the Field Trial Hall of Fame in 1987. A later breeding of Endurance with Miss Holmes yielded shooting dog celebrity Ch. Little Diamond, developed and handled by Eddie Rayl for owner Dr. L. G. Thompson of Vidalia, Georgia. Little Diamond was accorded the Hall of Fame scroll in 1983. The mating of Highway Man progeny Builder’s Risk with Bearwallow Babe in the spring of 1973 was also a portentous one, for it produced the great pointer, Builder’s Addition, and established a nick that would result in more than a dozen winners, including the highly acclaimed Builder’s Free Boy. Dewey Mullins of Berea, Kentucky was the breeder of record; Bill Ball of Danville, Kentucky was the original owner. By the time Freddie and Boy won the International Pheasant Championship that fall, the pressures of campaigning both Builder’s Risk and Builder’s Addition were beginning to wear on Ball, and the decision was made to sell Boy. A deal was struck at the Florida Championship in December that precluded leaving Builder’s Addition with the Rayls. Bill was not prepared to lose the dog. Many considered Builder’s Addition to be Freddie’s dog — he was responsible in large part for his development, had worked him and handled him to most of his wins. But when the time came to make a bid for the National Championship, the young handler deferred to the veteran and stepped into the scouting irons. “I had a thing with myself that I’d never run a dog in the National Championship unless daddy had won it first. And I didn’t.” Builder’s Addition had made a strong showing at Grand Junction in 1979 with Bill and Freddie helping each other. He came back the next year and won. A consistent performer, Boy amassed nine titles in the course of his relatively brief career, earning four championships and five runner-up wins. The 1980 National Championship was his swan song. He died a few months later. An abscess thought to be a grass infection had appeared in his side during the spring, and he was placed in the care of eminent Miami veterinarian, Dr. R. P. Knowles. By August, his condition was deemed sufficiently improved that he was sent on to the Rayls in Canada. “Boy was not a dog that would ever quit. The only time I ever saw him attempt not to want to go, and he went even then, was up in Canada that last year. He had cancer, but at the time we didn’t know it.” Boy had appeared to be holding up well in the roading harness, but he labored during a workout in preparation for the Saskatchewan Open. Something was seriously wrong. In Winnipeg, he was diagnosed with a ruptured spleen, then spots were found on his lungs. They shipped him back to Miami, where Knowles removed the growths, but seven-year-old Builder’s Addition survived surgery by only a few hours. Strongman, owned by D. C. Moses of Illinois, was another dog out of Rayl Kennels that would leave an impression on the pointer world in his own right as a champion and as the sire of Hall of Fame bird dog, Fiddler. Bill had done most of the groundwork with Strongman before passing him on to Freddie in Canada, but the dog was still a pretty good handful. “That was really a hard summer,” Rayl laughs, looking back. “Because I mean, that son of a gun was just knocking birds all summer long!” But Freddie met the challenge, and he won his first championship that season with Strongman. “Strongman was a beautiful dog on point,” Rayl says. “He was a tough dog to break on his birds, but he was consistent, and he was a dog that would not run off. He was an exceptionally strong bird dog.” With his uncanny eye for matchmaking, Bill Rayl paired the pointer with a prepotent Endurance female called Blythe Ferry Flack. Fiddler was one of ten pups in the resulting litter, whelped June 16, 1976. The list of Fiddler’s victories is not extensive, but his crown is embellished with some singular jewels. His two runner-up wins were gained in the spring of ‘78 at the Continental Derby and National Derby Championships. He won the International Pheasant Championship in the fall of ‘79 and performed so convincingly over the three-day span of the Quail Championship Invitational in 1980 that judges John O’Neall, Jr. and Barry Saunders did not name a runner-up. “He was leading by far the first day,” Rayl tells me when I press him for details. “The judges told me how much they liked him, and to go out there on the second day and just try to have a good, even day. So we turned him a-loose, and you know that son of a gun had that knack where, if you didn’t find birds with him pretty quick, he’d line out and take off on you.” True to form, he took off. Rayl had outlined a contingency plan for just such an occasion with scout Joe Bush. It was as a producer that Fiddler made his strongest contribution to pointerdom and to the field trial sport. As noted at his induction into the Field Trial Hall of Fame in 1998, he sired 122 winners representing nearly 800 wins. Most illustrious of his offspring was Ch. Fiddler’s Pride, whelped February 9, 1979. Rosemary Warnicke of Booneville, Mississippi was the breeder. ‘Ol’ Joe’ found his way to the Rayls by way of Dan Bonaguidi, who had been impressed on first sight with the pup’s inherent qualities. “As usual, Dan was right,” says Rayl, who adds that Fiddler’s Pride possessed the most natural front-running and bird-finding abilities that he had ever seen. Fiddler’s Pride won the Continental Derby Championship in 1981, and went on to prove his excellence repeatedly over the eight-year period that defined his competitive career, garnering a total of 24 placements that include eight major titles and six runner-up wins. He sired 84 winners, among them champions Fiddler’s Pride’s Iris and Melrose Buck. He died in 1992 and was honored by election to the Field Trial Hall of Fame in 1993, the first year of his eligibility. 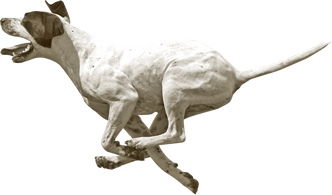 Evolution, Builder’s Addition, Fiddler and their ilk would make “Rayl” a household word among fans of great pointing dogs. In 1979, a brilliant son of Evolution by the name of Arrival won the National Open Shooting Dog Championship at the hands of Eddie Rayl. And in 1981-82, yet another star was poised on the horizon in the form of his littermate, Heritage’s Premonition. Johnny Robinson of Jacksonville, Florida had bred the litter, having acquired his good matron Pete’s Stylish Judy explicitly for the purpose of crossing her with Evolution. It was a good nick, and Robinson did a lot of winning with the pups on the southeastern juvenile circuit. “Then Johnny told daddy he was going to sell the puppies, and it was Heritage’s Premonition (formerly campaigned under the moniker, Robin’s Nest Sierra), Arrival, and another dog called Administrator which Eddie always said was the best of the bunch, but you never could keep him broke.” Bill fingered Heritage’s Premonition as the most promising all-age prospect and sold him as a derby to Jim and Judy Cohen of Berea, Kentucky. A period ensued during which Cohen tested the dog with other top handlers, but it was not until he rejoined the Rayls’s program that Heritage’s Premonition began to hit the mark in earnest, winning the Dominion Chicken Championship and getting the runner-up nod at the All-America with Freddie up front. Winning the Alabama Open the following January qualified him for the National, and the Rayls took him down to Martin Davis’s grounds at Reinzi, Mississippi south of Grand Junction to prepare for the stake. “Big was not a dog that would work real good,” Rayl says. “You’d see him in a workout, and you’d about swear he’d never …well, he’d go to this bush and that one, just not really do what he was supposed to do.” But when they turned him loose at a trial, he gave in spades and acquitted himself with distinction. He won the National his first time out, an achievement not many can claim. “Ol’ Big was a pretty good handling dog anyways, but I had a certain call that I could call on him and spin him around on a dime.” Near the end of the race, the dog had cast widely down an edge to the left. As Rayl sat watching him go, he became aware of the crowd’s growing elation. “You know how slow they usually go at the National,” he says. “Well, they were all riding right up there with me,” he says, “The judges, the gallery. Everybody was really excited.” Showtime! Rayl squalled and the dog whirled in his tracks. Just as they had stood in the limelight together in 1980 with Builder’s Addition, father and son accepted the laurels side-by-side for Heritage’s Premonition in 1982. In hindsight, it was a poignant moment. A timebomb was ticking, and its repercussions would be felt all too soon. At 56, Bill was still a young man, and for a while it looked as if he might fight his way back to good health. But his heart was giving out, inch by inch, and he was in and out of the hospital all winter. Bypass surgery was performed in February, but it did not improve things much. Bill showed the pups, but the physical effort tired him out and he complained of not feeling well. He excused himself and went to the house to lie down on the couch. “And when he laid down there, he just had a stroke.” Rayl says. Bill left an enduring legacy, both through the great dogs he bred, developed and handled, and in the people he inspired. His contributions to the field trial sport were many and varied. He was elected to the Field Trial Hall of Fame in 1984. Eddie Rayl eventually gave up the dog training life and went into the truck driving business, but Freddie has carried on the family tradition with a strong sense of purpose and pride. Except for a couple of off-season jobs to bring in extra cash, it’s all he’s ever done and he wouldn’t have it any other way. He keeps a couple of litters of puppies going. He has a good string of all-age performers and some promising young candidates coming on. He’s high on a talented first-year dog called Tom Pace. “We didn’t win any derby championships with him,” he admits with typical candor. “He’s a tough kind of dog, and he got kind of hard-headed with me last year.” But he’s got what it takes to win, Freddie thinks, and he’s aiming for the top. Things have changed since Bill Rayl’s day, but though it may be harder to hammer out a living as a professional trainer, Freddie says the intangible, day-to-day rewards are what make it worthwhile. Like Bill, he sticks mostly to working and training dogs he has bred and raised himself. It’s where he finds his greatest satisfaction. Barbara Teare’s interview first appeared in the 2004 Winter edition of Field Trial Magazine. Barbara Teare, reporting the 2011 Alabama Shooting Dog Championship, Union Springs, AL. We are proud to add Barbara to our list of Contributors. Her bio is available on the Contributors page. Photos courtesy Field Trial Magazine and The American Field Publishing.